There are several differences between these handsets, but what links them like twins are their nigh on identical appearance. We were asked by readers to compare the sizes, and without knowing the dimensions, to the eye, you can’t see any difference. Whilst this is NOT an OS/Software comparison, one thing I have noticed, and it has been said by people who are using both, that Nokia 800 takes “better” more pleasant looking photos. 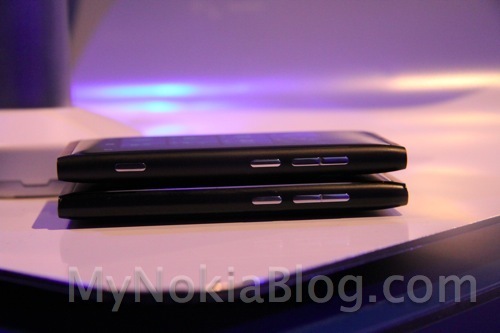 N9 are certainly more natural in some sense with colours but the 800 in the short samples I’ve seen was much better. Video on the other hand (I think there’s a bug in 800 where CAF is so slow). When the samples are up, I’ll link to that post.